Use the nail scissors to cut a small hole in the bottom of the cup using the nail scissors, it should be a bit smaller than your finger. 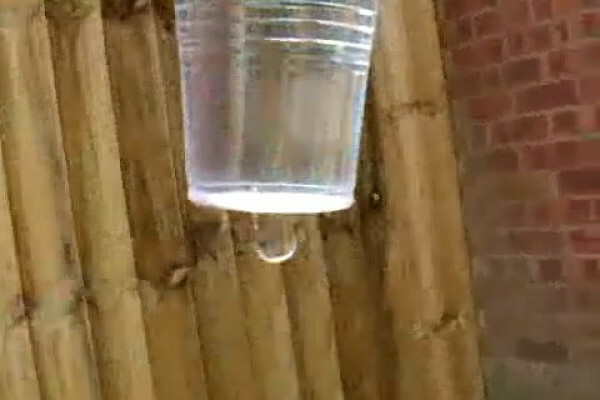 Put your finger over the hole and fill the cup with water. Stand outside, or somewhere that doesn't mind getting wet - if you want to do the experiment twice with the same cup, stand over something soft. rest the cup on the finger over the hole, and stabilise it with your other finger. Drop the cup by pulling your finger downwards as fast as possible - this means that the cup will be released very smoothly. Do you think that the water will fall out of the cup? You should find that the water stays inside the cup even though there is a big hole in the bottom - until it hits the ground anyway. On earth, if something isn't being held up it will accelerate downwards due to gravity. So if you hold onto a cup with a hole in it, the water will be pulled downwards through the hole and end up on the floor. What happens when you drop the cup? If you dropped some water and a cup they would both fall at the same rate, and so hit the floor at the same time. So of course if you dropped some water in a cup, they will both fall at the same rate and so they will stay together. This means that if you drop them both together they will both fall at the same speed and so the water won't fall out. What has this got to do with weightlessness and space ships? On the international space station there is roughly 90% of the gravity on the surface of Earth, but the astronauts float about. This is because when something is in orbit, it is falling all the time just like your cup. And because the space station and the astronauts are both falling at the same rate they don't move relative to one another and so it seems like they have not weight. So you have made the water act as if it were weightless. Next Rubber Fridge - Why elastic bands get cooler as they shrink! Does hot or cold water freeze first? Hello Naked Science. As you should know if you watched my movie, I am a Whiz Kids Champion. I also led the Wild Cats to a victory at the Academic Decathlon. Taylor, Martha, the gang, and I used this website so much to help our studies in the field of science. I will definitely show this to Ms. Haley Micheals, my chemistry teacher. I blew her mind when I corrected her in her equation, from 32/Pi to 16/Pi. This website really helped me when I was doing my science class on set during the filming of High School Musical. The articles and demonstrations are so helpful and I continue to use them for fun with my brother, Dylan. Thanks, man!